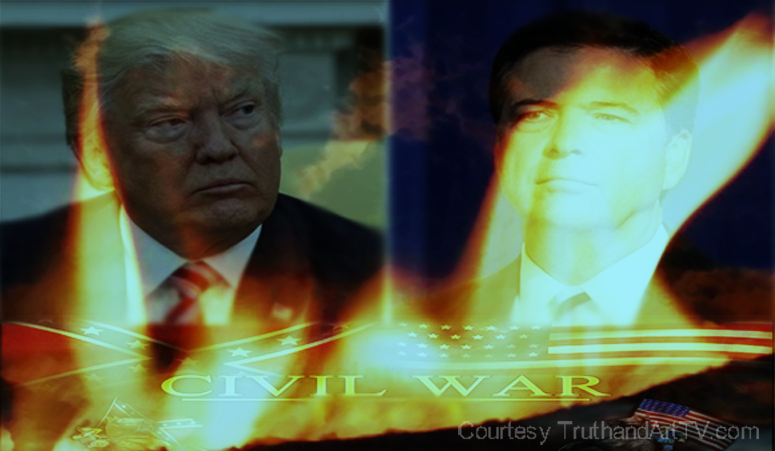 Here we are almost at the halfway point of 2017 and seeing the massive gap between facts and political opinions with respect to the coverage of the recent James Comey hearings before the Senate by the Leftist corporate mainstream media gives us all reason to believe that not only is the road to civil war moving along exactly as planned but also that many well meaning Americans will die fighting what they believe was the right cause. The lesson to learn here is that mass media propaganda works. Some say the notion of a second civil war is not where we are headed. Notice those saying this are primarily coming from the Left? That's because they see themselves as the "good guys" and being blind as they are to what is really happening (Thanks to Jeff Bezo's Washington Post, CNN etc) it is not conceivable to them how dangerous this struggle is getting. We are now on an inevitable road to "violent revolution", as the globalists called it years ago, as the deep state realizes their much preferred "peaceful revolution" is no longer effective. In the much preferred "peaceful revolution" the globalists wanted to force freedom lovers, America and Constitution lovers into submission without firing a weapon. This is when they force you to stop resisting them or you and your family don't eat. Many activists are familiar with these efforts by the ruling elite and have dedicated their lives to fighting these: Global forced taxation based on the "environment", mandatory vaccines based on pseudo-science for the sake of the collective, depopulation via programs that kill people and make them sick (GMOs, chemtrails, cell towers, EMFs etc), debt based banking getting everyone on a chip, mass surveillance and technocracy, etc. All of these atrocities against humanity were all supposed to have been part of the "peaceful revolution" because they don't involve actually firing a weapon as we know it yet they kill many. Many people say that what we are seeing today (that is, the active attempted coup d'etat on president Trump) is just a repeat of the past (JFK, Nixon, etc) but to that I say, only to a certain extent. Today, unlike in the past, we have the information age, we have mass awareness, and we have a divided deep state. This makes for a very different scenario which makes for a potentially very different outcome. The outcome this time, unlike the 1960's, is going to be whatever happens when many people push back against the deep state that murdered president John F. Kennedy, that assassinated Martin Luther King for opposing the wars and wanting to unite Americans especially blacks with whites. These people who hate America and today have promoted their globalist plans as the "cool" and "right" thing to strive for instead of "nationalism" and "isolationism" are playing with fire. They have undermined the rule of law. They have blurred the line between what is right and what is wrong. They have subverted individual freedom and individual rights in favor of the collective. They have funded and radicalized proxy armies to undermine both the nation states and the individual. They have unleashed advanced technology far beyond what was needed for humanity to live prosperously on earth and are thus guaranteeing a road to self destruction. And now they want to take it all. They have unlimited money and power and almost every major platform attempting to control and influence the masses (mainstream media, Hollywood, celebrities, politicians, social media, etc) belongs to them. This my fellow truth seekers, in every way shape and form is the makings of an end game scenario. So if you truly care about humanity (not the "environment") more than anything else you'll see that we are at a major crossroad in both American and human history. Brace yourself for what is coming and ask yourself, what do you believe in? And perhaps more importantly, WHY do you believe in what you believe? Why ask why? Because it's not worth dying for the wrong cause.